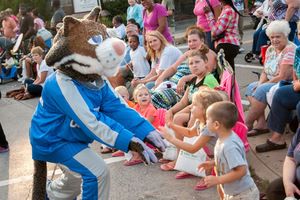 With Penn College in Williamsport turning 100 years old this year it was only appropriate for their Wildcat mascot to get in shape and hit the community to celebrate! Keystone Mascots was charged to help triple his availability (wink wink) and offer him a newer, cooler wardrobe option that allowed more breathability for his performances. Thanks to Hurst of Park Avenue in Lancaster for their impressive logo work. And keep an eye out for the Wildcat - he's already left his mark on the Little League World Series and he's not done yet!